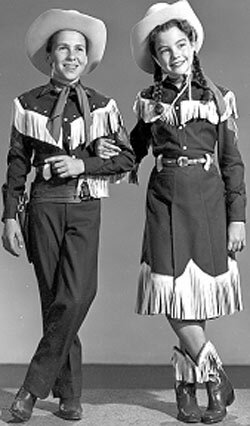 “BUCKAROO SHERIFF OF TEXAS” (‘51 Republic) The first of four Rough Ridin’ Kids B-westerns with juveniles Michael Chapin (Red) and Eilene Janssen (Judy) as junior versions of Roy Rogers/Dale Evans —at least that’s what Republic hoped for. Trouble was, Saturday matinee kids want-ed adult heroes—Roy, Rocky, Johnny Mack, etc. Kids didn’t cotton to seeing other kids their age in heroic action. Although it didn’t pan out, it was a noble last-ditch series western experiment for Republic. Problem was, it was tough for scriptwriters to involve kids in hard action sequences, you always had to have an adult figure which kept changing from title to title—in this one it’s Hugh O’Brian. Arthur Orloff’s plot has gun-law tyrant Tris Coffin holding a vast ranch by force, taking over while Chapin’s father, Steve Pendleton, is away fighting in the Civil War. Chapin’s grandfather, Sheriff James Bell (a series regular), does all he can to oppose the gunmen. The action revolves around the secret to Boxite deposits (for the manufacture of aluminum) on the ranch in a toy wagon left as a present for Chapin. Eilene Janssen is introduced when she arrives with her older sister Alice Kelly. 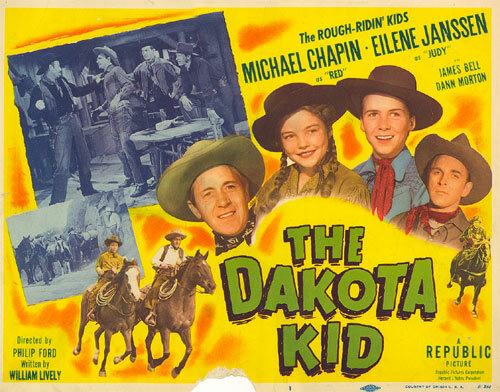 “DAKOTA KID” (‘51 Republic) Best of the four Rough Ridin’ Kids westerns. 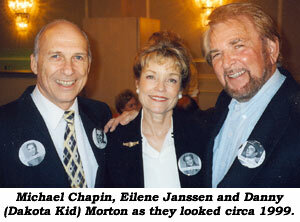 Michael Chapin is Red, Sheriff James Bell’s grandson, and Eilene Janssen is Judy, Red’s friend. House Peters Jr. is her father. When the outlaw situation gets too much for him to handle, Bell sends for his nephew whom he’s not seen in a while. The badguys employ outlaw Danny Morton, the Dakota Kid, to take the place of Bell’s nephew. But spending time with Red and Judy and becoming a part of Bell’s family and the community gets under Morton’s skin and turns him straight as he rebels against the gang that hired him. Eilene sings a quick ditty. 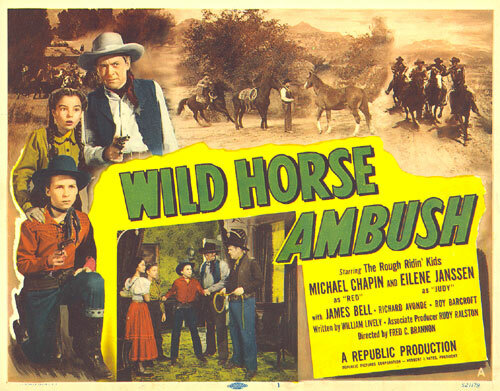 “ARIZONA MANHUNT” (‘51 Republic) The Rough Ridin’ Kids win over an outlaw’s daughter to the side of law and order. The adult in this one is John Baer (later of “Terry and the Pirates” TV fame). This entry gives us an “origin” story for Judy. “WILD HORSE AMBUSH” (‘52 Republic) See pinto horse spots change right before your eyes! Three different pintos battle it out using stock last seen in “Pride of the Plains” (‘44). The Rough Ridin’ Kids, in their fourth and final B-western (aborted from a planned 6) give support to Mexican border patrolman Capt. Richard Avonde who is masquerading as a Mexican bandit on the trail of counterfeiters who are forcing a Mexican engraver and his daughter to work for them. For you earnest equine watchers, Chapin refers to his horse as Arrowfire. When I was 13, Republic undertook a worldwide search for a boy and girl who could follow in the footsteps of the fabulously popular Roy and Dale. According to press re-leases, no stone was to be left unturned in their global quest for the perfect pair. Prior acting experience was not a requirement. It was at that tender age I learned the meaning of “creative writing”. Gee, what a surprise to find the perfect talents right under their noses, living less than 10 miles away, and both seasoned veterans to boot! That part of it may have been funny, but everything else was just plain fun. 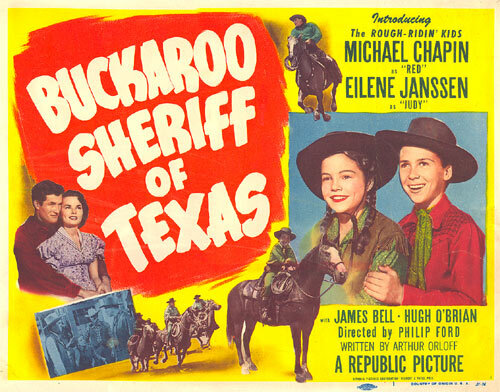 I was just 14 when “Buckaroo Sheriff” was filmed. To prepare us for our roles, Republic focused on making Eilene Janssen and me polished riders, so every weekend we were off to the stables. We were good and eager students, and once shooting started both Phil Ford and Fred Brannon proved to be really terrific, understanding directors. During lunch breaks they both turned a blind eye while some of the wranglers on the set taught me trick-riding. I’m still thrilled by the memory of me, barely 5 feet tall, smartly dismounting from this giant of a horse whose backside is digging a furrow in the ground so he can come to a skidding stop from a dead gallop within 10 feet. I looked good doing the running side mount, but that sawhorse vault from the rear—naw, I wasn’t tall enough and my arms were too short. It must have been fun to watch me try, though. Kid actors certainly can find their work environment intimidating at times. They’re expected to perform perfectly, be miniature adults, be seen and not heard, obey everybody and understand the ways of the world. And yet, what I remember best was how much we were loved, pampered and protected at Republic. Those were magic days. I certainly was blessed and enriched by the experience. I didn’t even mind the weekly trip to the studio hair salon to get my hair dyed red in keeping with my character’s name. 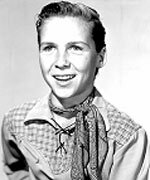 The only regret I have is that the Rough Ridin’ Kids came down the trail just as the whole westerns genre was gittin’ outa town. It could really have been something. Or maybe not. Roy and Dale were clearly one of a kind. How could we have possibly filled their boots?